Every culture and time has wise men and women, those to whom others look for guidance and advice. Throughout the centuries, leaders have chosen, either formally or informally, advisers to offer sound counsel and assist with decision-making. For example, in politics of the ancient days, the king’s court served this purpose; in modern times, a president’s cabinet does so. Among communities or an extended family, certain people are routinely sought for their wisdom and sound advice. The book of Proverbs celebrates all who live toward wisdom, who are willing to learn from life, regardless of education. Proverbs upholds the pursuit of wisdom as a high calling, perhaps our highest, but never for personal gain or recognition. The pursuit and living out of wisdom is always for the blessing of the larger community and the proper honor of God. 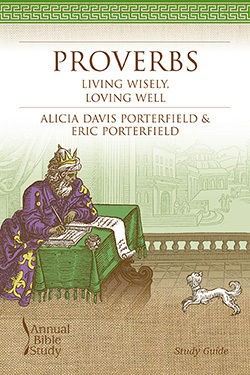 The book of Proverbs aims to help all believers live in ways that bless others and honor God. The study of Proverbs, the book itself tells us, helps us on this journey toward wisdom and roots our lives in those things that truly matter the most (1:1-7). This Teaching Guide for the Smyth & Helwys Annual Bible Study on Proverbs includes teaching options, suggested worship and sermon outlines, and approaches to leading discussions and group study. This study also includes relevant lesson plans for including youth and children in a congregational study of Proverbs. This Study Guide for the Smyth & Helwys Annual Bible Study on Proverbs serves three purposes: to educate the learner on major issues of appropriate interpretation, to offer an overview of theological themes, and to build the learner’s Bible study skills by reviewing significant interpretations. Each session comes with thoughtful questions for reflection and discussion.